The UK’s most sophisticated AMR alarming system, Smart Spaces alerts site contacts when potential energy wastage is identified. Take the hassle out of energy management. 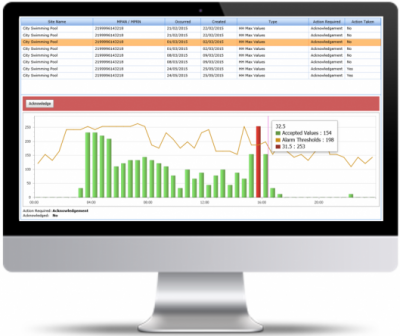 Through user-configured alarm rules, Smart Spaces is a powerful and intuitive energy management tool that utilises the power of AMR data to help you take effective action on energy waste. Designed to assist energy managers with multi-site portfolios, when an alarm is triggered the software sends an email to a designated site contact, meaning you don’t have to be at the location to make a difference. Smart Spaces allows us to set boundaries for acceptable usage for every half-hour for every meter across our entire estate, and notifies us the next day if there are any problems. SmartSpaces is an EU-funded project to save energy in public buildings using ICT, with an overall aim to significantly lower carbon emissions through reducing energy consumption throughout Europe. The three year project set up 11 pilot cities across 8 countries and was operated by a consortium made up of 26 partners including local authorities, universities and technical partners such as Cisco, BT and SystemsLink. SystemsLink worked in partnership with Bristol City Council where the major focus was to convert massive quantities of raw energy data into formats that are usable for a wide variety of end users to make utility monitoring and targeting accessible to a larger audience. This has allowed staff across the council to visualise their energy usage and easily pick up on energy wastage and poor performance. This in turn has greatly reduced the time windows between issues occurring and action being taken, resulting in lower energy consumption and usage. Furthermore, it has allowed the Energy team to identify and concentrate their efforts on the most serious problems and those with the highest payback solutions. To find out how you can benefit from the Smart Spaces module call our office on +44 1234 834650 or email sales@systems-link.com.